North Shore Condos 225#205 - Weekly Only - Summer rentals begin on Saturdays. Swimming Pool. Private Beach. Great Lake Views. Cannery Row 18. Best Location. Walk to Downtown and Lake Michigan right across the Street. Some Views. When you want the lakefront location but don't need all the fuss of a giant home, this studio condo is the perfect solution. 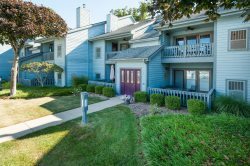 Everything you need and the best location in South Haven. Private beach for North Shore Condominium guests, walking distance to downtown shops, an easy stroll for a morning paper and cup of coffee, and your toes in the sand within a minute. Compact and cozy, the condo still feels open with large windows and a great view of Lake Michigan.